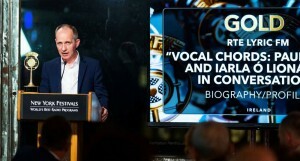 Vocal Chords is a multi award winning music documentary series made by Athena Media for RTÉ Lyric fm presented by one of Ireland’s most acclaimed sean-nós singers Iarla Ó Lionáird made with the funding support of the BAI and the TV licence fee. The series poses that eternal question of ‘why do we sing, and what happens when we sing?’. Iarla meets and records with outstanding singers and discovers their motivation, influences and their life’s relationship with their voice and singing. We started with Peter Gabriel (2015) and then added episodes with Sinead Ó Connor, Christy Moore, Julie Fowlis, Paul Brady, Peggy Seeger and Maighread & Tríona Ní Dhomhnaill. More recent guests include Glen Hansard, Linda Buckley and Veronica Dunne, with the full series now having been broadcast, all episodes are available to stream via Soundcloud.